Sega of Japan has decided to crease production of the Sega Dreamcast effective spring 2001 and that means 2002 was the last year of the once acclaimed 128-bit DC. Sega will now focus its efforts on its software, not hardware. Now games like Sonic the Hedgehog, Virtual Fighter, Sega Sports titles, and other Sega big names will now be on other game systems. Back on the launch day of September 9, 1999 things were looking great for Sega because of all the big titles like Sonic Adventure, Soul Calibur, and NFL Y2K. All those games were all huge hits and the system was off to a good start. The dream machine also came packed with that free 56k modem (the PS2 didn't even have that feature build in) so it was possible to play online or go on the internet with the DC. Unfortunately none of the launch titles supported any online play leaving many players disappointed especially Sega Rally 2 fans. People also didn't like using the internet on Dreamcast because they thought it was too slow. Another problem people have ran into was when certain games like Blue Stinger, Sonic Adventure, and many other launch titles wouldn't load on their Dreamcast, and they had to go back and get a new one. Although the DC was a hit 1999, the year of 2000 would prove to be a much tougher year. In 2000, the Dreamcast sure has its ups and downs with games like Resident Evil: Code Veronica, Crazy Taxi and NFL Y2K1 doing well while others like Shenmue, WWF Royal Rumble, and Time Stalkers bombing big time despite all the hype they got. Shenmue was the multi million dollar Virtua Fighter RPG project that was going to sell the system. Although the graphics were amazing and the story was good, the game itself was a bit on the dull side and the game failed to wow the public like Sega had planned. Sega also had some tough competition from Sony with their new PS2 and the PSone, plus from Nintendo too thanks to the continued strong sales of the Nintendo64 and Game boy Color. In 2001, Sega decided to pull the plug. Despite some big releases this year like Sonic Adventure 2, Crazy Taxi 2, and Phantasy Star Online, with the Dreamcast fading fast in Japan and heavy competition from Sony and Nintendo, Sega was just losing too much money. If there some good news about the Dreamcast's death here, it's that this fairly powerful game machine is going relately cheap (usually going for $49.99 Canadian that's a mere $29.99 US) that's way cheaper than getting one of those newer console. There are still a lot of great games that are discounted as well so you can build a larger collection of games with less money than other systems like the current generation. If you are thinking about becoming a serious Video Game collector or you already are then now is the time to start collecting Sega stuff while it's still in stores, look how quickly the Sega Saturn fell off the face of the earth, eh?! 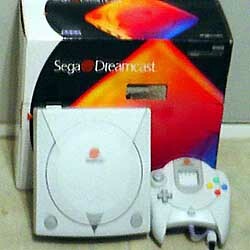 Find Dreamcast on eBay here! Rare scale: 3/10 you won't find this at stores like Walmart anymore but they are usually still cheap. This is a special report by my friend who just won a DC. GCDs not standard--not a CD, not a DVD; how well supported? Stupid people will not allow the light gun released because of all the lunatic kids in the U.S. shooting other kids these days. Sega copies Sony's idea of their Japan only device, the Pocket Station, and we finally see what these miniature Game boy’s with Memory card features are all about. The batteries can really wear out if you use to LSD screen on the go too much and the VMU only holds 200 blocks of space (Most games take around 50-80 blocks) but it's still very unique. The DC Controller is virtually identical to the 3d Sega Saturn controller that originally came with Nights but there are less buttons and more serial ports for additional add ons like the Sega Jump Pak, Microphone, and VMU. It feels a little too bulky when compared to the PlayStation controller and the analog and Dpad feel too loose at times but it's still a solid controller overall. Only works on the Sega Dreamcast and no other game system. I have played my fair share of bad games for this 128-bit machine too. The Rarest DC games: get em while you can!